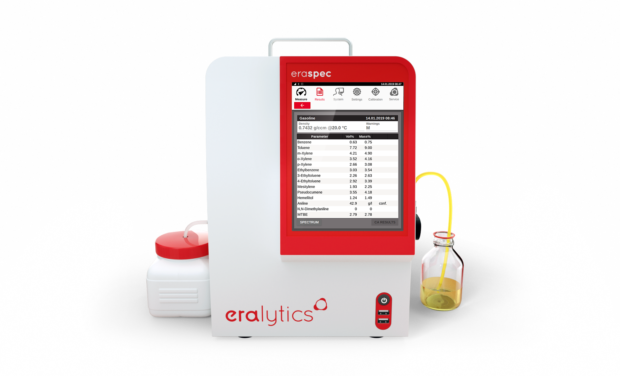 ERASPEC is eralytics’ industry-proven multi-fuel analyzer with several thousand installations worldwide. It offers measurements of fuel component concentrations and of complex parameters like RON or cetane number for gasoline, diesel fuel, jet fuel and even specialized fuels like ethanol fuels. A single push of a button delivers all results in only 1 minute. 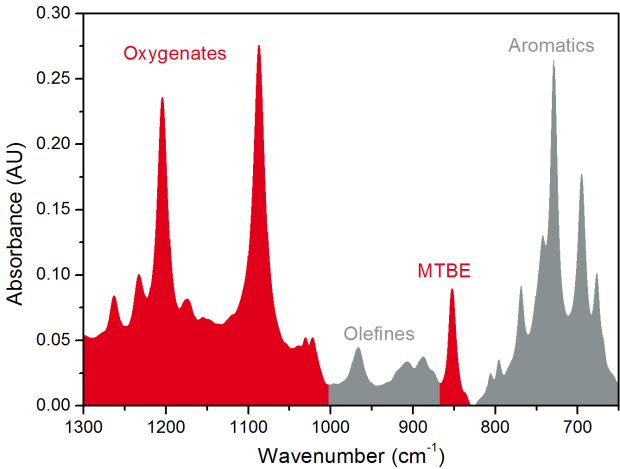 In FTIR fuel analysis a spectrum of the analyzed fuel is recorded in the mid-infrared region using an Fourier transform spectrometer. 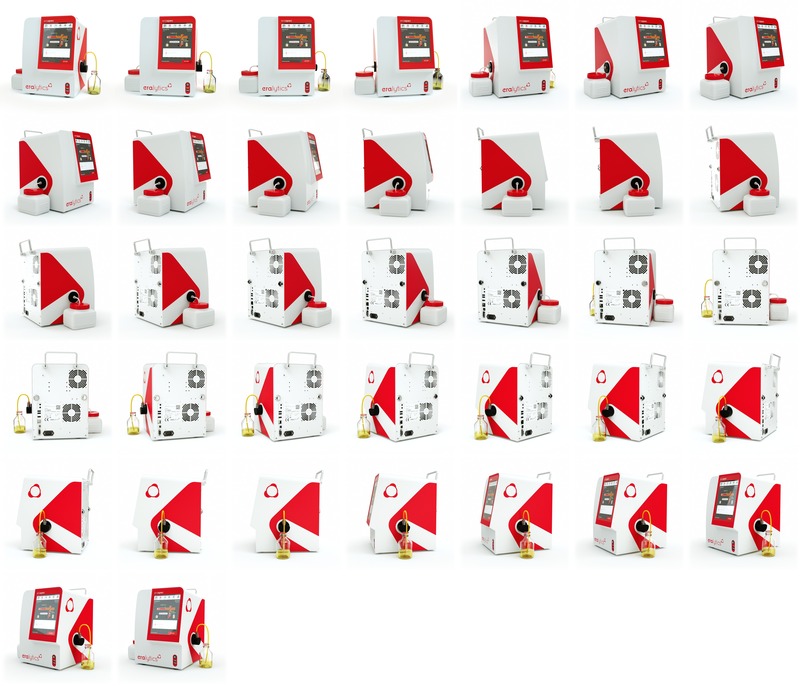 Depending on the chosen method a single measurement is able to detect over 40 parameters within a few seconds. For gasoline measurements e.g. RON, MON, AKI, distillation properties, esters and aromatics concentrations are determined. 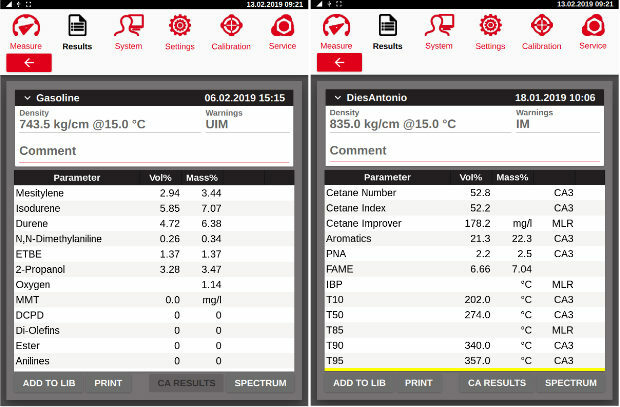 When analyzing diesel aromatics, cetane improvers, biodiesel and many more can be quantified. 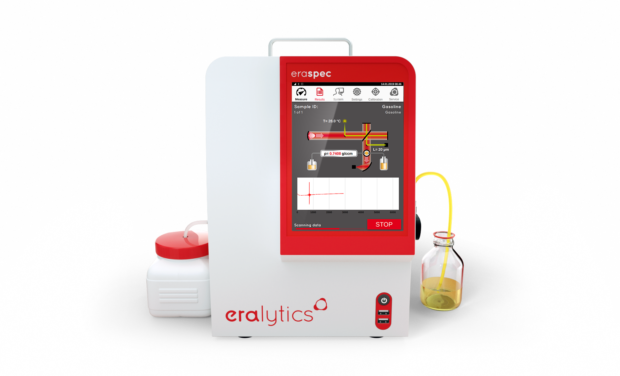 Analyzing biodiesel ERASPEC distinguishes between FAME / FAEE and vegetable oil. 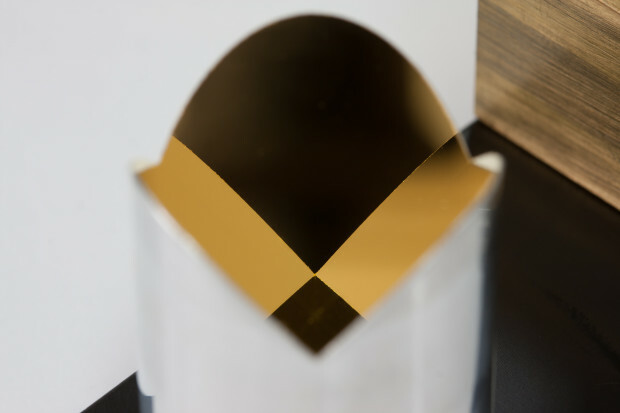 It measures FAME in full compliance with ASTM D7806 and EN 14078. Typical parameters for jet fuel include FAME, aromatics, freezing and flash point, smoke point and distillation parameter, as well as viscosity. ERASPEC can directly derive fuel component concentrations from the measured IR spectrum. That includes aromatics such as benzene (ASTM D6277), oxygenates such as MTBE or ethanol (ASTM D5845) and octane boosters such as MMT for the measurements of gasoline. Knowing the exact fuel composition, however, also allows to calculate more complex fuel parameters. ERASPEC uses chemometrical models, based on fuel libraries, to calculate parameters such as RON, MON or distillation and evaporation fractions from the spectrum for gasoline. It covers cetane number and index and many more for diesel fuel. 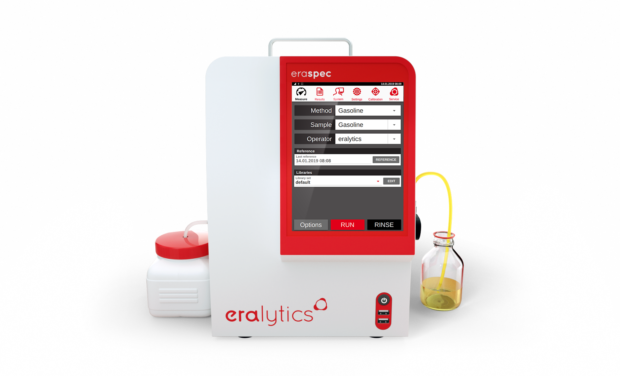 While the ERASPEC fuel analyzer comes already with factory installed databases that, depending on the chosen modules and requirements, it is easily expandable by the user. These databases provided by eralytics are tailor-made to the typical needs within a given country or region. Adding customer samples to the databases is as easy as running a measurement and entering the corresponding reference values afterwards. The added data is used right for the next measurement as the chemometrical models are calculated on the fly. Additionally it is possible to add new user defined parameters the same way to tailor future measurements. The “Automatic Fuel Recognition” (AFR) Module allows an easy measurement of unknown samples with the ERASPEC fuel analyzer. It recognizes if gasoline, diesel or jet fuel is measured and automatically starts the correct analysis according to the registered fuel type. Most common contaminations of gasoline can be measured with the “Gasoline Contamination Module”. Typical substances that can be quantified are DMM, N-Methyl-Aniline, Diolefines, Aniline, DMC, various Butyl-Acetates and more. This makes the ERASPEC fuel analyzer to a reliable tool to fight fuel adulteration fraud directly at the gas stations. The heart of the ERASPEC fuel analyzer is a patented corner-cube retro-reflector FTIR spectrometer. For highest precision it uses a laser / temperature control and a spectral resolution tailored to the task of fuel analysis. This reduces any noise to an absolute minimum, increasing the repeatability and lowering the possible limits of detection. Additionally ERASPEC is equipped with an original eralytics’ innovation: the triple-cell design. ERASPEC automatically selects between a 20 µm and a 100 µm path length measurement cell depending on the fuel analyzed. This allows ERASPEC to always deliver the best measurement result possible. A third cell is used to run background measurements if needed. 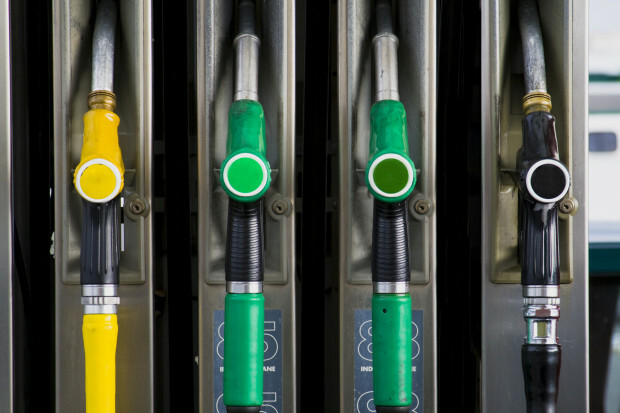 For standard measurements of gasoline the 20 µm measurement cell is suited best. 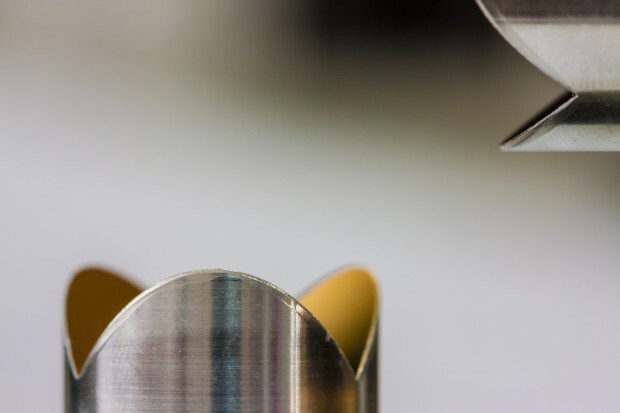 Using its 100 µm cell, however, ERASPEC can easily lower its limit of detection if it comes to low concentration measurements of contaminants in gasoline. The measurement steps are visualized on the display, showing the deflection of the moving mirror of the interferometer. When the measurement is completed the results are displayed and can be printed or added to a library with a single click. When adding the results of the fuel analyzer to a library an editor for entering known properties will appear. 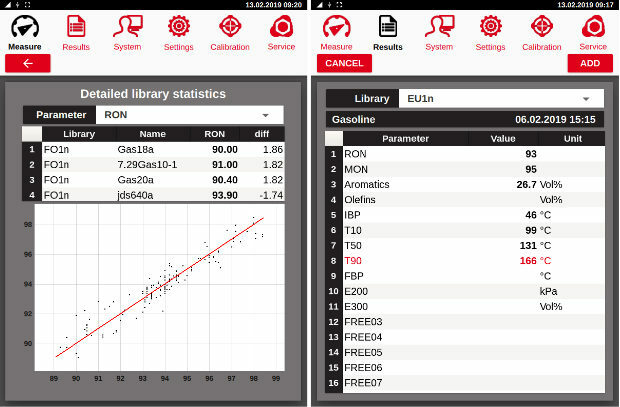 This will improve the quality of future measurements using the ERASPEC fuel analyzer, as the library can be tailored to a specific application. Easy addition of unlimited user-defined properties. 1 … The range and repeatability for all correlated properties depend on the used database. 2 … Lowest concentrations correspond to the limit of detection (LOD), all concentrations in Vol% and wt%. Watch this video to get an overview on the sample handling and measurement procedure of ERASPEC. Article on "Onsite Fuel and Lubricant Quality Control by portable FTIR analysers"